A pipe beveling tool which has been upgraded with three blades that work together to rapidly provide compound bevels on highly alloyed, heavy-wall pipe is being introduced by Esco Tool of Holliston, Massachusetts. The MILLHOG® Dictator Pipe Machining Tool securely mounts to the inside diameter of heavy-wall pipe from 4.5” to 18” I.D. using three wide clamps with hardened steel contact points. Featuring a 3-blade tool holder and formed TiN coated blades that dissipate heat away from the pipe’s surface, it can perform a 37-1/2 x 10 degree bevel or any other angle simultaneously. 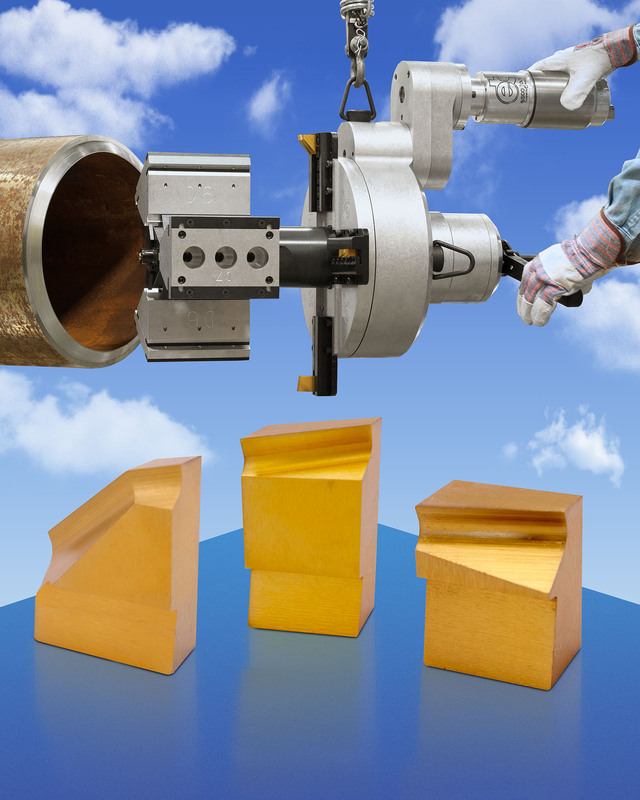 Capable of precision machining end preps that permit high integrity welds and faster weld times, the MILLHOG® Dictator Pipe Machining Tool develops 4,100 ft.-lbs. of torque at the cutter blade and pulls a continuous thick chip without cutting oils. Ideally suited for stainless steel and super duplex piping systems, this beveler has an easy to maintain 3 HP air motor. The MILLHOG® Dictator Pipe Machining Tool is priced from $21,995.00 and is available for rent from $850.00 per week, depending upon location.